After the palace, we wandered out beyond the very sturdy walls guarded by Roman soldiers (or really fit men in roman soldier uniforms, who knows really) and found ourselves in the market. I love local markets as it gives me an authentic snapshot into the life of a local. We bought enough fruits to make any girl happy before heading off for lunch in Fife. We decided to splurge a little for our meals today to celebrate me turning 23! Back to Fife, they have probably the fastest Wifi connection I’ve had the pleasure of using. And awesome food, of course. 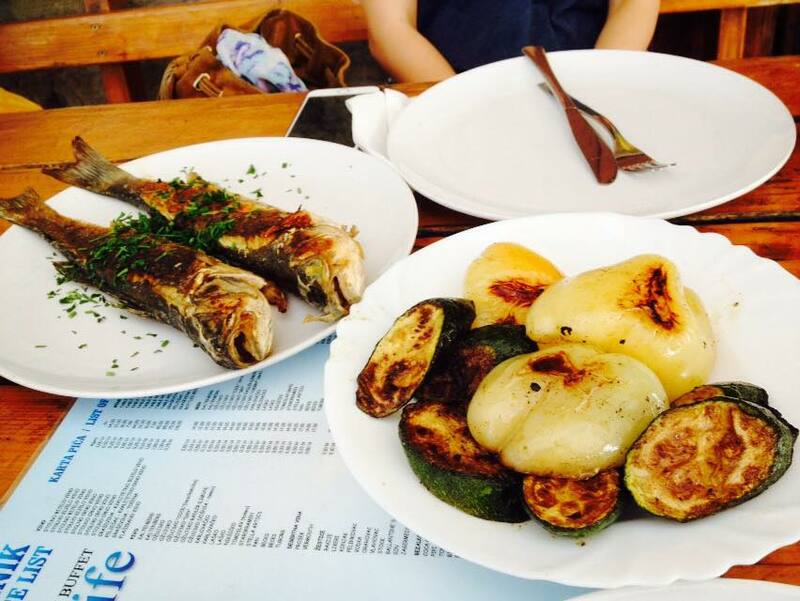 We had a simple meal of grilled fish and vegetables and my mind has never been so blown. The waitstaff were hilarious and the prices here were much more affordable compared to those by the harbour. After lunch, we took a long stroll to the beach. We decided to go to Ježinac (pronounced Yezhinyek), far away from town as it was quieter and had nice lookout points. It was also well-known for being a swim-y beach compared to the shallow, more populated ones at the other end of town. A brewing storm not too far away. After lazing around for a while, I decided to stop being a baby and put my feet into the cold waters. I took my first step into the sea and found that it was rocky and uneven. I took my second step only to land on something pretty sharp. Before I could take my third, the waves crashed on my tiny human body and I found myself having to find my footing on anything stable. This was the dilemma – the waters weren’t deep enough to swim in, but the seabed was too uneven to walk out on. I decided to swim out because I’m light enough, or so I thought. As soon as I had gulped down enough sea water to make me gag, I decided to call it a day and got out of the sea. As I walked back to our spot, my feet felt funny. I looked down and found a pool of blood and about three cuts per foot. I braved the situation by freaking out, on the inside. It definitely looked worse than it felt but I was shocked at how much blood multiple small cuts and one gash could make. We decided to head back not too long after that. For dinner, we went to Atlantidia and it was great. A specialty here is cuttlefish risotto, which we shared along with shell fish in wine sauce. Dinner was nothing short of awesome. The bowl is larger than my face. That night, we headed back nice and early to catch up on some 30 Rock and a good night’s rest.